The walls are decorated with architectural motifs. The coffered wooden ceiling framed by cornices is further embellished by a central quatre-foiled motif inside which Diana is painted, seated against a country landscape. The goddess is armed with a bow and two dogs, her faithful hunting companions, lie at her feet. In this room there is a display of drawings, plans and documents relative to certain aspects of the building and the family patrimony. Although the painted wooden ceiling with its central medallion characterises the room, the richly decorated walls are of no less worthy of note. A skirting painted as imitation marble decorates the lower part. Imitation cornices are painted with spiral and leafy motifs to frame the openings, and a continuous frieze runs round the upper perimeter with luxuriant naturalistic motifs, notably brightly coloured fruits. The medallion in the centre of the ceiling depicts the mythological Endymion who, according to legend, inspired feelings of fiery love to Selene. Behind him, a small Eros seems to be the artificer of this love, as he shoots one of his arrows. In this room portraits of some illustrious members of the family are displayed, as well as documents concerning the granting of noble titles. This room owes its name to the vast frescoed area on the vaulted ceiling. Against a background of a wide blue sky with scattered clouds Apollo's chariot seems to fly past, while Eos (Aurora) and blind-folded Eros let showers of delicately-coloured petals fall. Trompe-l'oeil architectures, painted on the walls, create the effect of two storeys, and end in a balustrade looking down over the inside of the room. On the walls the eight preparatory drawings on paper backed with canvas for the frescoes (1837), still visible in St Martin's parish church in Tirano, are the work of Antonio Caimi. They were brought to Palazzo Salis, where a sister of the painter, Maria, had married Count Rodolfo. Antonio Caimi was born in Sondrio in 1811 and studied first in Pavia and later at the Brera Academy in Milan. He was famous as a portrait painter but also very interested in archaeology. He encouraged the founding of an archaeological museum in Milan: Member of numerous commissions for the restoration and conservation of historical monuments, Antonio Caimi died in Milan in 1878. Herodotus was no doubt struck by the hanging gardens of Babylon and the pyramids of Egypt. The temple of Artemis at Ephesus came after his time, as did the Mausoleum of Halicarnasssus, built by Artemisia in memory of her husband Maussollos, and the chrys-elephantine statue of Zeus at Olympia (all from the 5th to the 4th century BC). The Colossus of Rhodes and the Lighthouse of Alexandria appeared some decades later. Here an eighth “wonder” has been added to the seven traditional ones listed above: the Colosseum. The anonymous painter has succeeded in creating a particular perspective effect, frescoing the eight scenes in lunettes which rest on broken frames, “open” chromatically towards an imaginary outside world. Conceived as an access area between the stairway and the Room of the Eight Wonders, this little opening is in fact a room in itself, with rich and varied decorations. The lunettes and ceiling are frescoed with mythological scenes, with gods and goddesses seated on chariots drawn by horses in open, luminous spaces. Jove, Apollo, Mercury, Mars and Juno are all clearly recognisable. Copies of Valtellina’s civil and penal statutes (with different dates) can be seen in the showcases. An impressive stucco fireplace characterises the room. 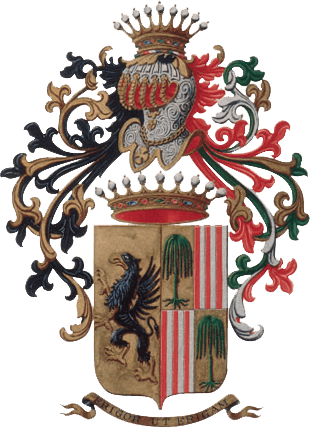 The coat of arms on it testifies the granting of title of “Count” to Giovanni Salis by Emperor Leopold I of Hapsburg (26th August 1694). At the sides of the cowl, two putti hold up a well-auguring cornucopia. On the front there are two figures: Justice armed with a sword and Fortitude holding up a pillar. Sustained by two other putti is the Count’s quartered coat of arms: an uprooted green weeping willow on a gold background in the first and fourth quarters, and red and silver vertical bands in the second and third. "The candid panels provide a well-chosen contrast to the pink stucco corbels, decorated with female faces and and spiral motifs. A foild cornice illustrates the myth of Endimion, the young man who obtained from Zeus the gift of eternal youth and with whom the moon goddess, Selene, fell in love. The chromatic effect highlights the fleshiness of the young man while the goddess Selene is distinguishable by her golden ochre colouring." The name comes from the 4 framed busts in the decoration in the vaulted ceiling. On a painted multi-linear cornice, figures of telamons alternate with four “Turkish” heads which support the central quatre-foiled medallion, with paintings of mythological figures identifiable by their attributes: Zeus with an eagle, Juno with a peacock and Mercury with his winged helmet. The six lunettes show pleasant scenes, characterised – apart from one – by a central figure representing, according to the relative attributes, hunting, war, devotion, wisdom, and life. The sixth scene, with a group of figures, conveys the impression of a family Parnassus. A painted imitation trabeation delimits the space of the walls from the space above; twelve lunettes open out, creating the impression of a blue sky with scattered clouds. Twelve telamons in different positions with different expressions on their faces fill the vaulted ceiling. Four of them support the octagonal medallion in the centre, where three putti holding a golden crown seem involved in a festive dance. What strikes us on entering is the magnificent fireplace, with its stucco frames displaying the coats of arms of the Salis and Wolkenstein families, to which Giovanni Stefano and his wife Caterina respectively belonged. Other related family coats of arms are depicted in the elaborate drapery above the doorways. Along all of the upper parts of the walls runs a frescoed frieze with views and urns, alternated with columns on which other coats of arms are painted. From the first painted balustrade, upheld at its four corners by four telamons, pointed arches reach up creating a wonderful perspective effect. A second balustrade delimits the central lanterna , which imitates, through the painted windows, an external opening. In the centre the dominating image is of Bacchus, seated on clouds blown by the winds. The private chapel, dedicated to St Charles Borromeo, in baroque style, dates back to the beginning of the 17th century. It previously belonged to Simone Venosta. The main entrance to the church is from Via San Carlo, but there is a private entrance from the first floor of Palazzo Sertoli Salis through a passage over the street. The church has a single nave and a square apse. Light comes in from a tripartite window. In the vaulted ceiling there are frescoed medallions with the Assumption of the Virgin, St Francis and St Charles. The barrelled roof of the central span is embellished by a motif with octagonal, hexagonal and cruciform coffering in blue and gold stucco. On the arch of the chancel the coat of arms of Simone Venosta stands out, with an eagle and red horizontal bands, held up by two angelic figures. Symmetrical to this on the triumphal arch are the coats of arms of Giovanni Salis and Costanza de’ Perari.